Found the source code for a qbasic editor source code I have been looking for. Immediately compiled it for linux via qb64. Need to make some changes though. Planes are flying so low overhead, the afterburners almost gave me a hair cut. Updated an old old laptop. 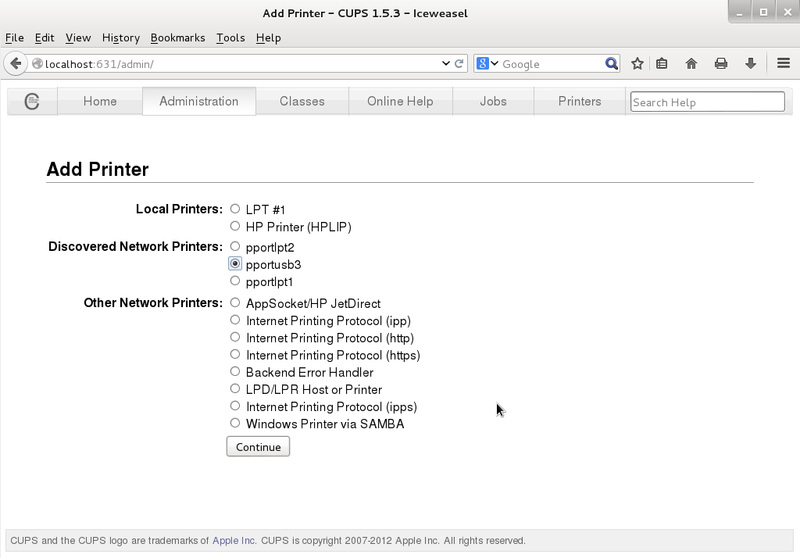 Setting a network printer is easy as setting up most any other printer. You need to know about the printer location make and model. You will also need some administrative rights to install the printer. 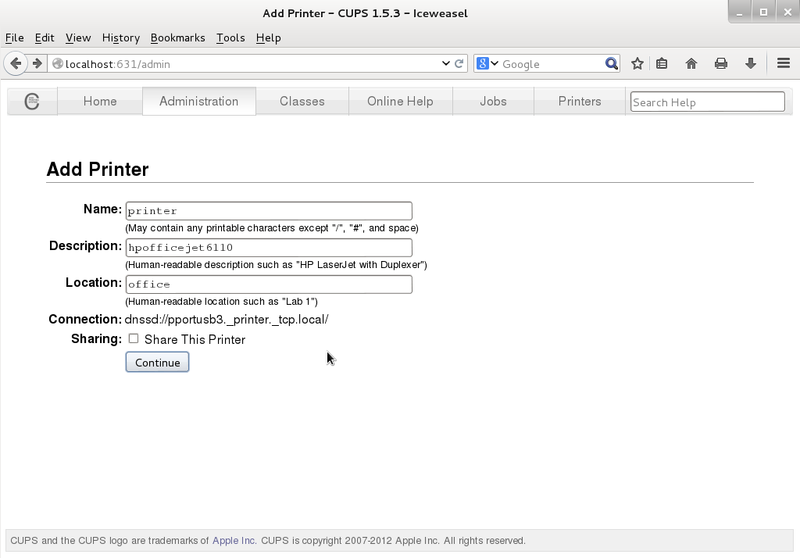 In this case, we will be using the Cups web based utility to accomplish adding the printer. First, if you do not already have access, you need access. Whew, that is all the command line you need to do. Now you need to open your web browser to “localhost:631”. Localhost is just a generic name so you do not have to use your real ipaddress. When you first go to cups, you will be asked some rudimentary questions about your setup. Then you need to choose a printer. On this network you have one print server that has two parallel ports and one usb port. Notice that cups recognized the equipment (make sure it is turned on!). You could have just as well chose a local printer if that was the one you wanted to use. You can always add more printers later. 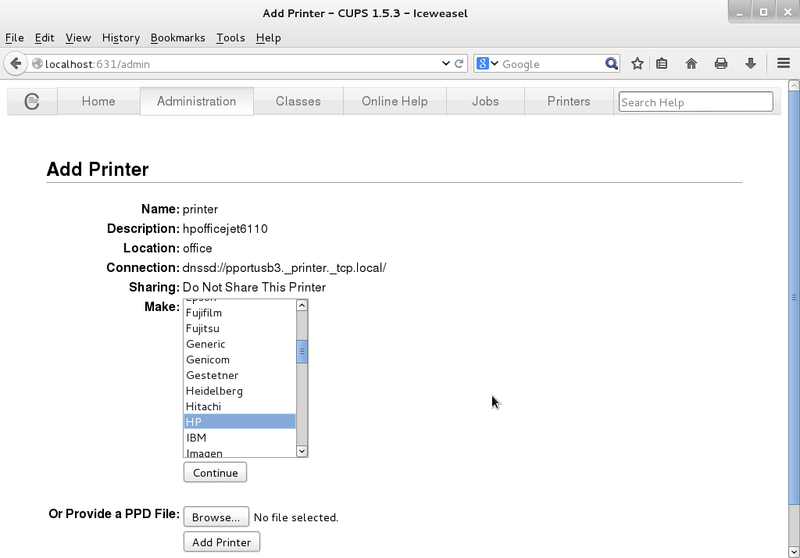 For now we are choosing pportusb3 or the third port on the printer server that has a usb interface. The we can choose the printer manufacturer. Press continue. In our case, we have an HP printer. Pretty common nowadays. For the computer to be able to communicate and control the printer, you need what is known as a printer driver. Tradidionally you would have to go find the printer install CD/ DVD. 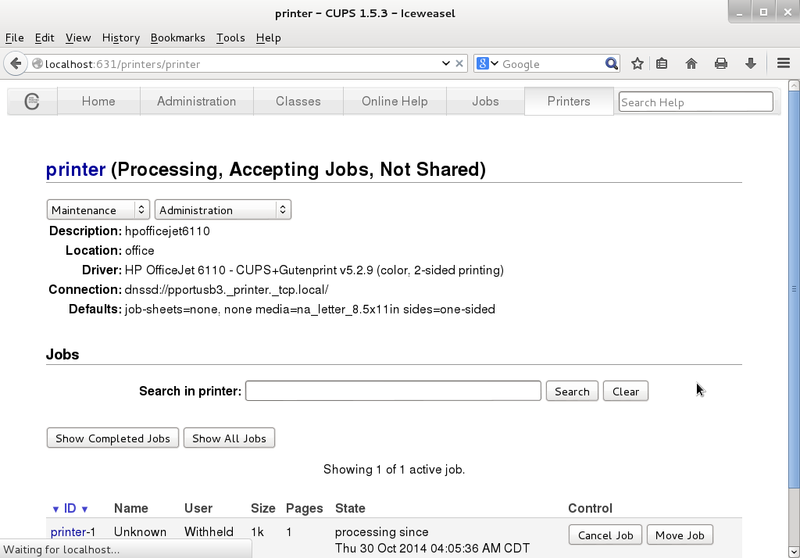 Fortunately Cups already has quite a few printer drivers to choose from. So the printer driver install media will be pretty much a drink coaster. Our printer is an OfficeJet 6110. Awesome, that is one of the available drivers! 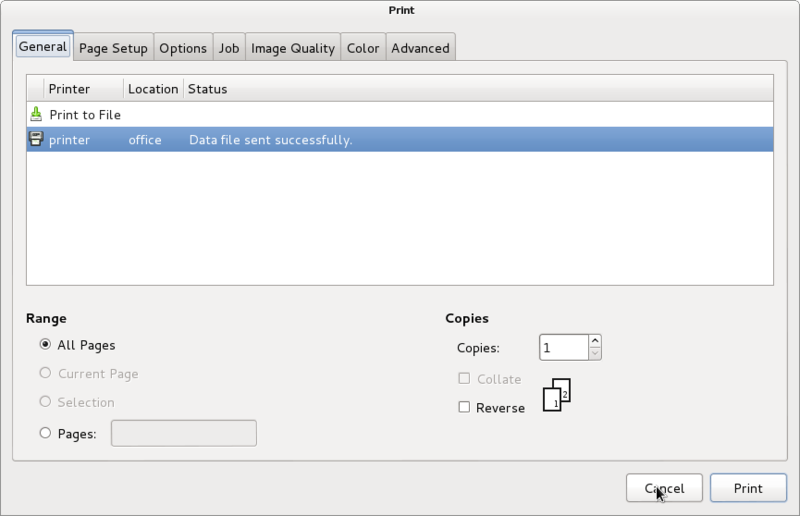 So press add printer and let the driver be installed. Then you will need to install the default options. Go with the existing default options till you have seen a print out. You can easily change these options later. Press set default option. Your printer shoudl be pretty much setup now. 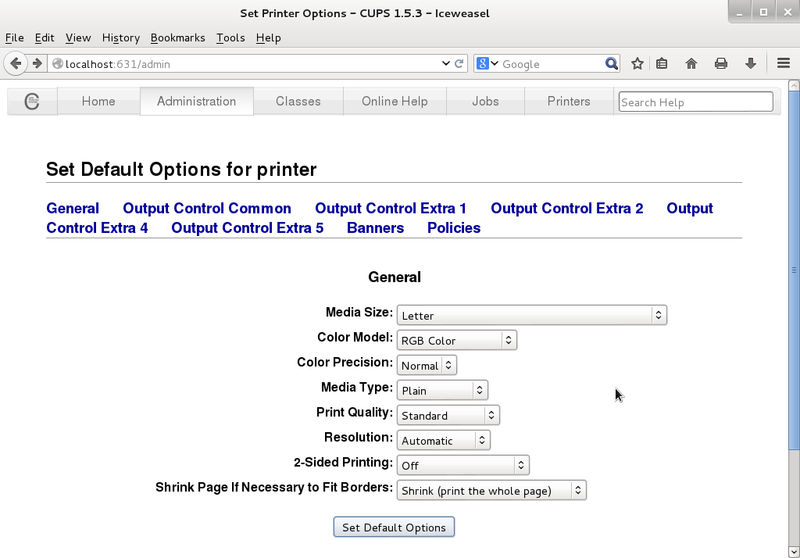 You can go the admin pull down menu and print a test page to see if any default options need to change..
Once you have chosen to print a test page, you will get a message at the bottom of the screen about the page being printed. You are now done with the printer setup. You can visit the other menus or just close the browser. 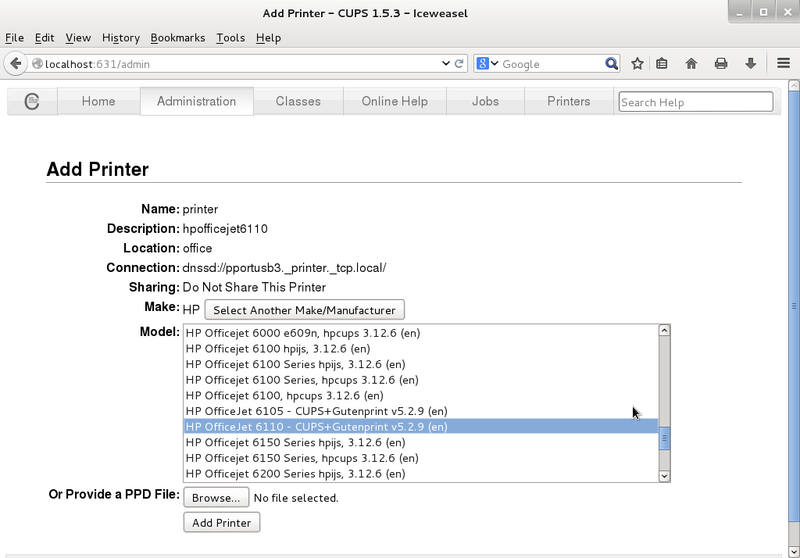 Now the next time you need to print, the print option should show you your printer. 1. Get Arch Linux.2. Download Arch installation media. The primary forms are image files for CD or USB Key available on the Arch Linux website. Go to the Arch Linux website and select a version. If you are unsure which form to download, select the Core ISO appropriate to your processor architecture (e.g. i686 or x86) 3. Burn the image to CD using your preferred CD recording software or, in Windows XP, by right clicking on the .iso file and selecting “Copy Image to CD”. Alternately, if you downloaded the USB Key version, use the Bash command: dd if=path-to-iso of=/dev/sdX. Alternatively you may use other software to image the USB drive. 4. Insert the prepared device into the computer you are installing Arch on and restart the computer. The computer should start up into a menu system similar to the one shown below. 5. Select “Boot Arch Live” and wait for the system to auto-detect your devices and start up. When it is finished, you will be running Arch Linux live from the installation media. 6. Log in as root by typing root at the login prompt. It does not require a password. 7. Run the installation script by entering /arch/setup. The menu based process is designed for ease of use, and will give useful feedback. 8. Use the arrow keys to highlight “Select Source” and press enter. If you chose the core installation media select “CD-ROM or OTHER SOURCE”. Select OK at the prompt. You will then be returned to the main menu. 9. Select “Set Clock”. Choose the appropriate timezone and then select set time and date and choose the appropriate time format. Confirm that the time is correct and select return. 10. Select “Prepare Hard Drive” and select the appropriate options. If you are installing Arch on a clean system or do not intend to dual boot with another preexisting operating system, simply select “Auto Prepare.” If you would like to partition the drive manually select the appropriate option. Make sure to check documentation on partitioning and formatting Linux drives. 11. Enter “Select Packages” and look through the packages available, pressing space to select the highlighted package and enter to finish selection. The base system will always be installed; for a minimal system, select no packages. For a system with additional basic tools, select the base-devel package category, or go through the packages and select those you want individually. 12. Enter “Install Packages” and wait while the script installs your operating system. This may take a while. 0dh. Enter “Configure System” and go through the options. If you do not know which to select, choose the default option. When you reach the screen labelled “Configuration” with files listed, go through each if you wish to check or change the default contents of your config files. Make sure you set a root password that you will remember, you will need it to administer your system. Beginner users can leave the rest of the configuration files alone. 14. Select “Install Bootloader” and choose your bootloader. If you are unsure which to select, choose GRUB. At this point, you will be prompted to examine your bootloader configuration file. 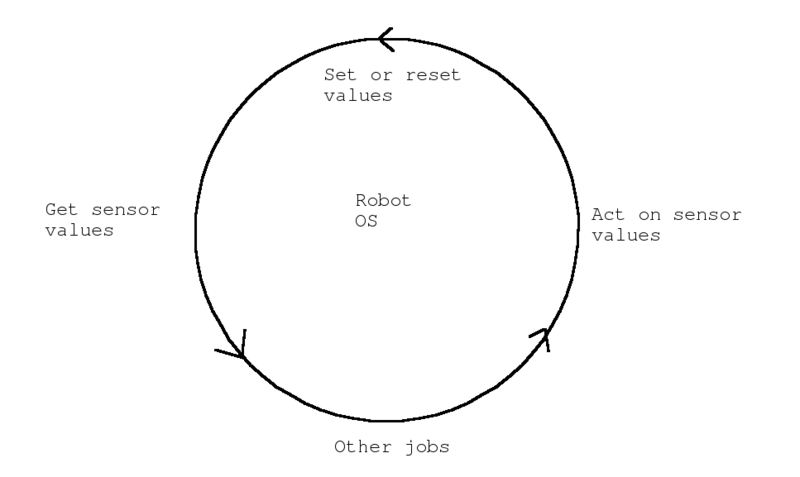 If you are not dual booting, you will not need to make changes. If you have a Windows operating system installed, ensure the Windows entry in the file is not commented out by removing the “#” signs in front of each line. If you want Windows to be the default, make sure you change the default line. When prompted to select the boot device to install the bootloader, select the entry without a number at the end, such as /dev/sda. 15. Exit the installer and type “reboot” to restart your system. Wait for your computer to boot into your new Arch Linux operating system. Login as root with the password you entered and enjoy your new system. 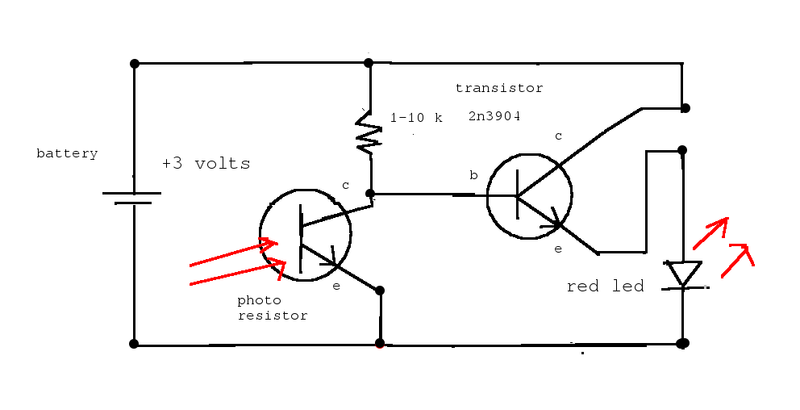 Simple dark detector circuit. 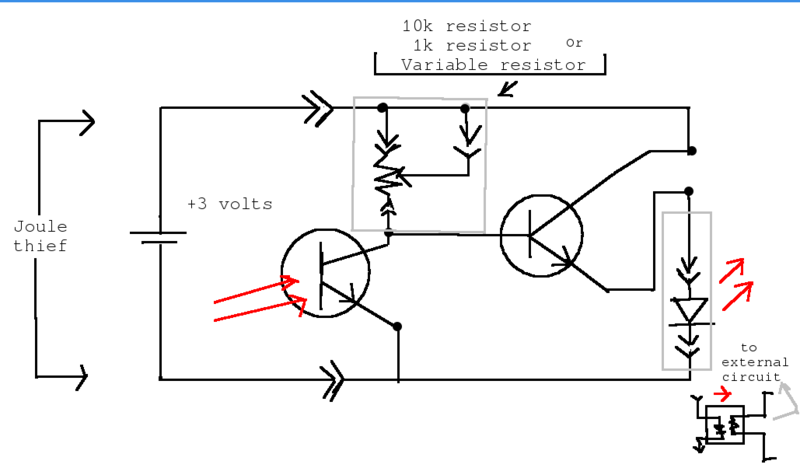 A quick and easy night light circuit. The enhancements could be added. ‘ Do what is needed based on input values. I know this code is a little messy, and will flicker, but it’s written for clarity. 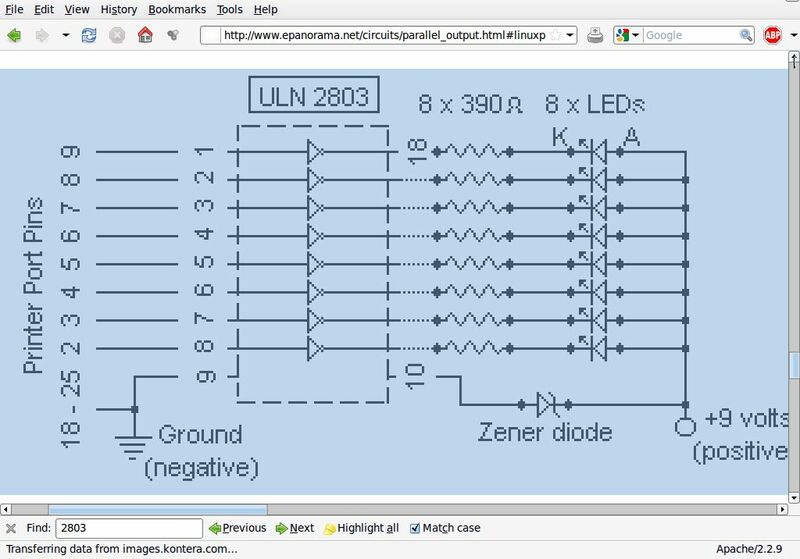 The same code can be used to monitor the other four input lines by changing to the ‘8’ to another number from the table. Part IV Do what is needed based on input values. 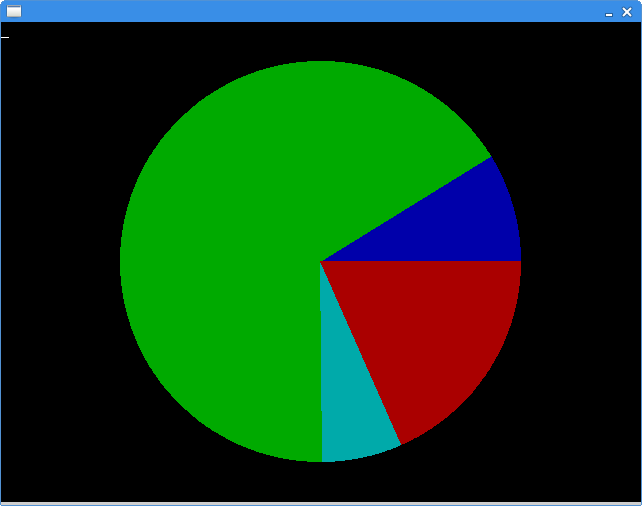 Pie chart: Just something to play with.